The world has different people; it has those who were born with spoon on their mouths, and those who have struggled to become successful. They both deserve congratulations for what they’ve achieved with or without the help of their parents. In other words, every hardworking person needs congratulation, from the most loyal employees in a company and best student in school to the most humble waiter in restaurant and a potato seller downtown. Why not appreciate someone with a congratulation letter!. 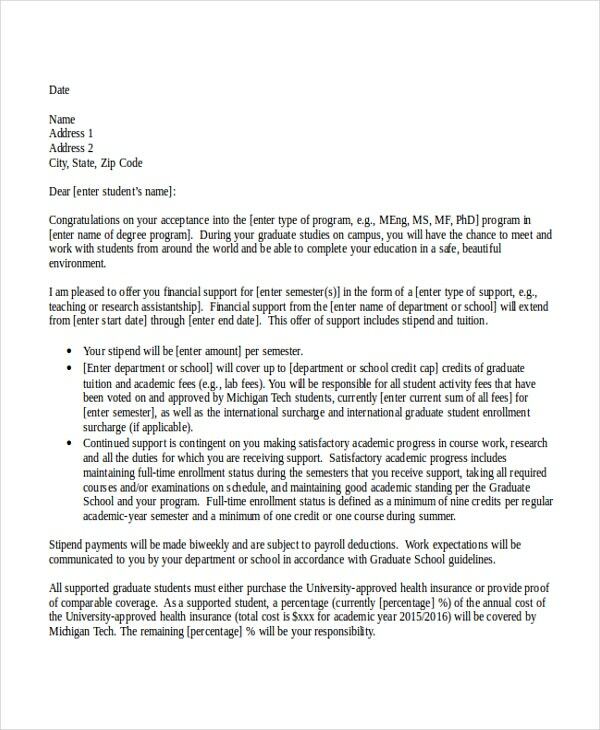 You may also see Business Letter Template. The letter tells the recipient that they have done well in their activities. It shows that they deserved the award presented to them. 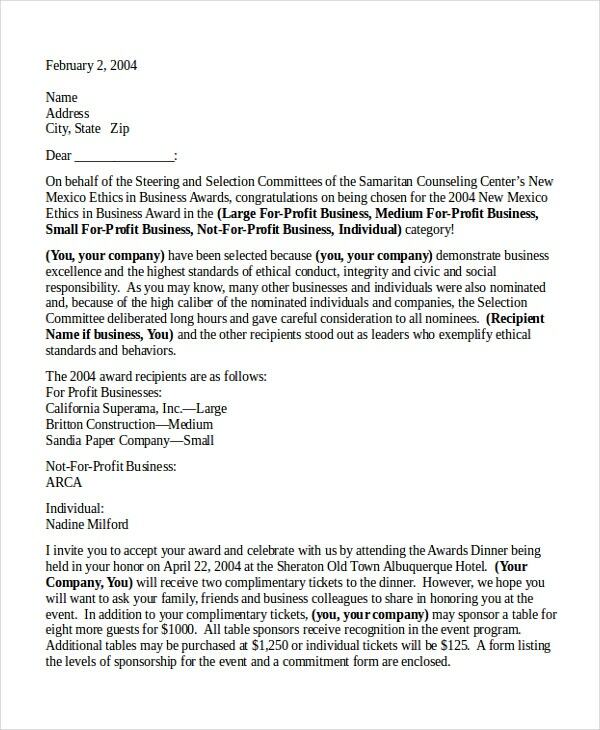 The congratulation letter for award is easy to write; you only need a congratulation letter template. 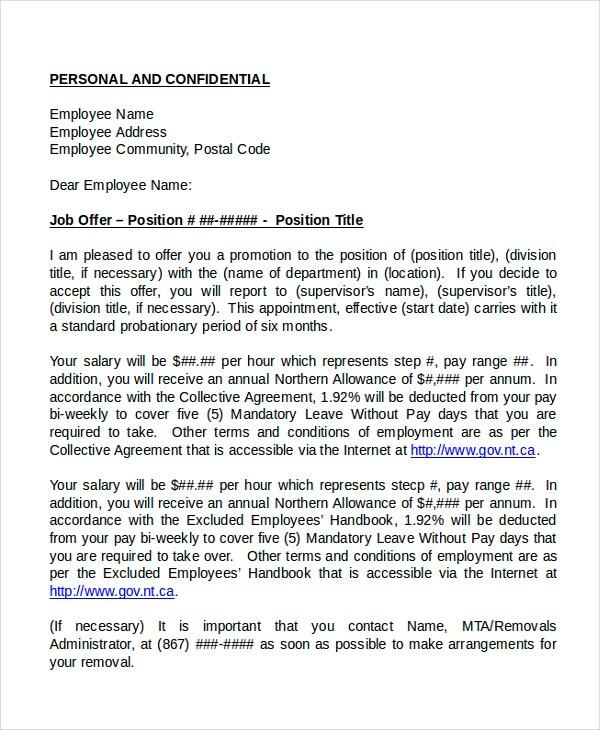 You may also see Resignation Letter Template. A person who works so hard indeed deserves a promotion. After promoting an employee in the company, it would be best, too, if you write to them a congratulation letter on promotion. Being an achiever is a great thing, so if someone in your company has helped the business achieve its goals, the person indeed deserves recognition. The best way to recognize what someone did is to use a letter of congratulation. People have different ideas about approaching marriage, but a larger number often consider weddings to be the right way to marry someone. You can send a congratulation letter for wedding to someone who just changed their relationship status. 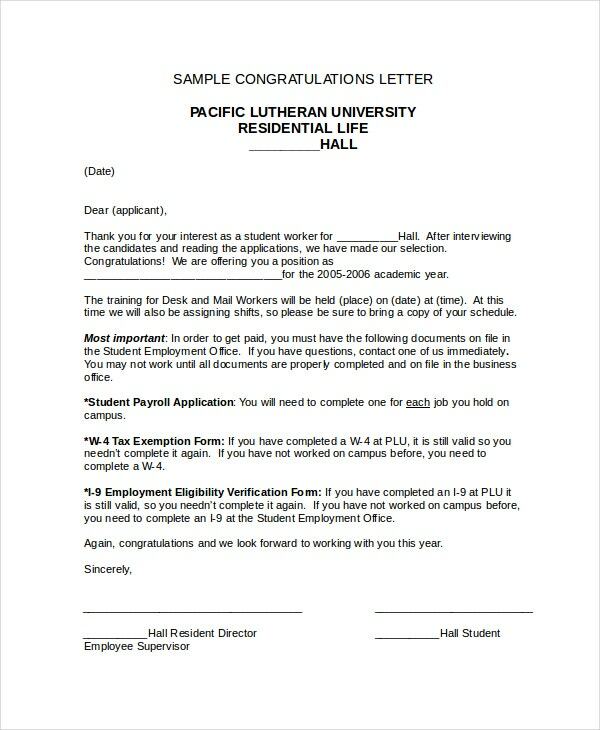 A formal congratulation letter must follow a professional letter-writing format. 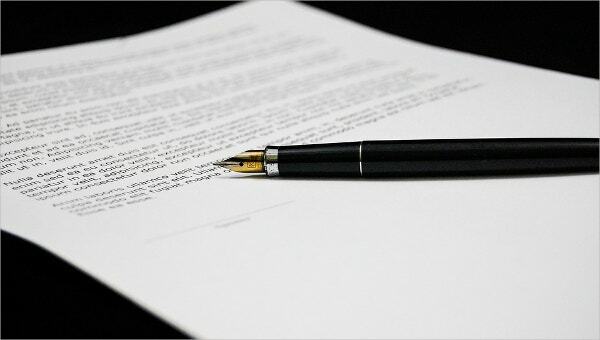 Usually, it has an official address, the name of the recipient, the subject matter, the body of the article, a conclusion, and the writer’ signature. 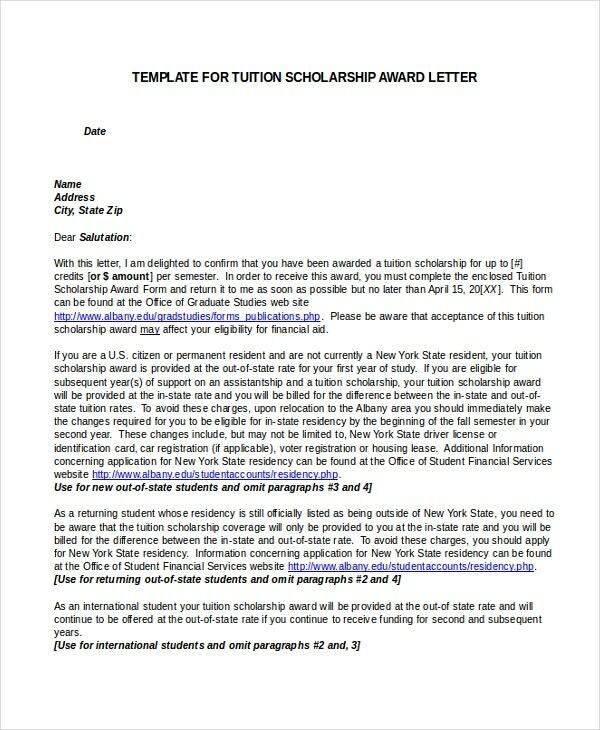 > What is the Purpose of a Congratulation Letter? It is important to understand that people write the letter for different reasons, which means that the recipients of the notes are often different. However, it is easy to analyze all the reasons and purposes for writing the letters and deduce a preliminary goal for all the letters. You may also see Marketing Letter Templates. As such, it is safe to say that the primary reason for writing these letters is to appreciate people for the good work done, the trophies won, or the achievements. The congratulation letter on achievement will make the recipient feel good, more so, because they really worked so hard without expecting recognitions. 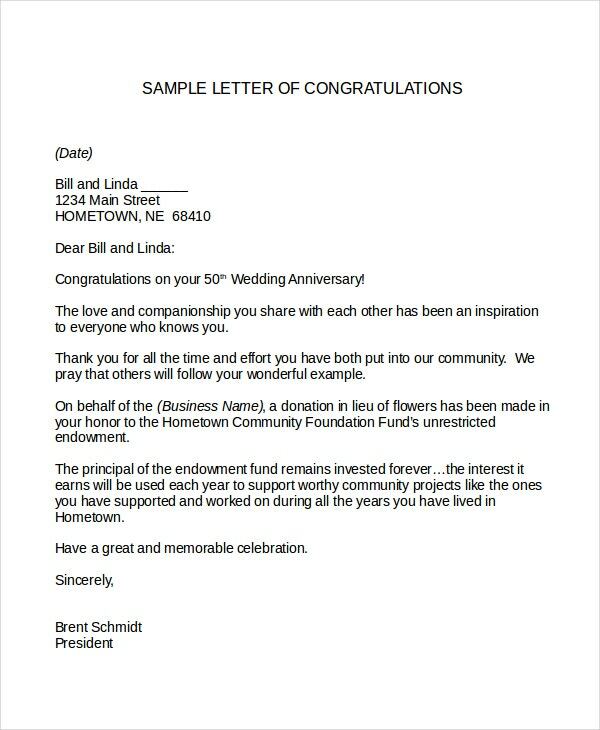 > Who Can Write a Congratulation Letter? Anyone can write a congratulation letter. The main question should be why you’ve decided that you want to write the letter. Many people write the letter to express their appreciation for the good things that someone else did. By good things, we mean actions taken to make business society, life, or oneself better. 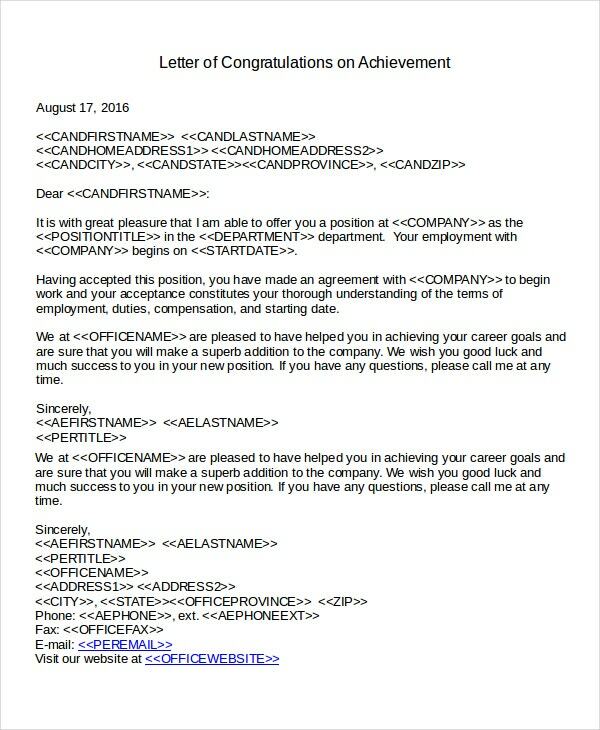 You may also see Resume Cover Letter Template. 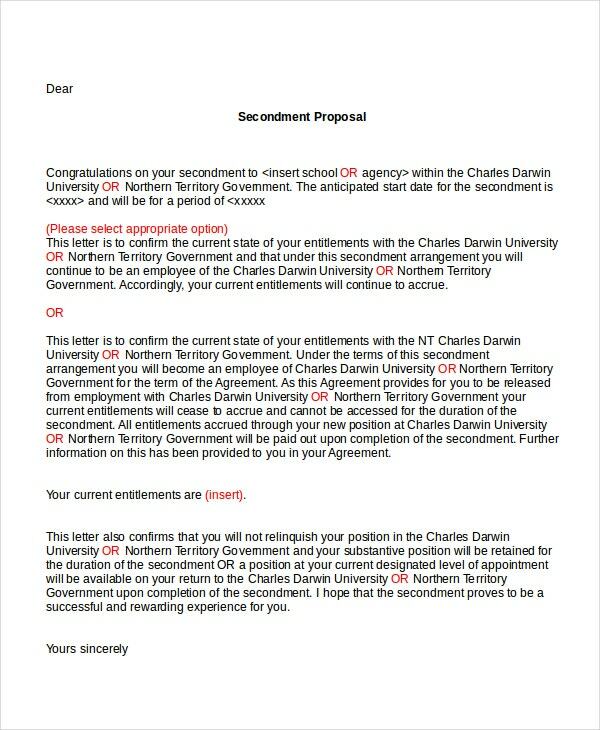 It is important to understand that you can also use a congratulation letter for new position to, further, remind the recipient to continue doing a good job in the same position or a new post. People who put value on the time that others spend to make the society a better place will always see the need to write the congratulation letters. The write is the only one who knows the name of the recipient. As such, it is important to know to whom the letter concerns before making the decision to write it. The next thing you need to do is to decide why you want to congratulate someone. Understand this: there are different reasons for congratulating people; so many, in fact, it is difficult to outline the reasons here. Once you decide why you want to congratulate someone, write the letter and send to the recipient. You may also see Resignation Letter Template. It is difficult to identify the good that people do, but don’t fail to appreciate people who do well. Although people give gifts as appreciation for the good that people do, you can also express you gratitude by writing them a congratulation letter. The purpose of the congratulation letter is to let the recipients know that they’ve been doing well.